2010-08-01. Good. Ships with Tracking Number! INTERNATIONAL WORLDWIDE Shipping available. May not contain Access Codes or Supplements. May be ex-library. Shipping & Handling by region. Buy with confidence, excellent customer service! 2011-04-06. Good. Ships with Tracking Number! INTERNATIONAL WORLDWIDE Shipping available. May not contain Access Codes or Supplements. May be ex-library. Shipping & Handling by region. Buy with confidence, excellent customer service! 2011-04-06. New. Ships with Tracking Number! INTERNATIONAL WORLDWIDE Shipping available. Buy with confidence, excellent customer service! 2010-03-06. New. Ships with Tracking Number! INTERNATIONAL WORLDWIDE Shipping available. Buy with confidence, excellent customer service! DC Comics. Hardcover. 1401228755 Like New Condition. . Fine. DC Comics. Hardcover. 1401228755 New Condition. . New. DC Comics. Hardcover. 1401228755 Please allow 4 - 14 business days for Standard shipping, within the US. Thank you for supporting our small, family-owned business! . New. 2010-12-14. DC Comics. Hardcover. 1401228755 Please allow 4 - 14 business days for Standard shipping, within the US. Thank you for supporting our small, family-owned business! . Fine. 2010-12-14. DC Comics. Hardcover. 1401228755 New Condition *** Right Off the Shelf | Ships within 2 Business Days ~~~ Customer Service Is Our Top Priority! - Thank you for LOOKING :-) . New. DC Comics. Hardcover. 1401228755 Please allow 4 - 14 business days for Standard shipping, within the US. Thank you for supporting our small, family-owned business! . Fair. 2010-12-14. DC Comics. Hardcover. 1401224180 New Condition *** Right Off the Shelf | Ships within 2 Business Days ~~~ Customer Service Is Our Top Priority! - Thank you for LOOKING :-) . New. DC Comics. Hardcover. 1401224180 Please allow 4 - 14 business days for Standard shipping, within the US. Thank you for supporting our small, family-owned business! . New. 2009-09-22. DC Comics. Hardcover. 1401224180 New Condition. . New. DC Comics. Hardcover. 1401224180 Please allow 4 - 14 business days for Standard shipping, within the US. Thank you for supporting our small, family-owned business! . Fair. 2009-09-22. DC Comics. Hardcover. 1401224180 Please allow 4 - 14 business days for Standard shipping, within the US. Thank you for supporting our small, family-owned business! . Fine. 2009-09-22. New York: DC, 2010. Comic. Illus. by Walter Flanagan. Fine. Hardcover. 1st Edition. A square solid tight clean un-read as new copy. 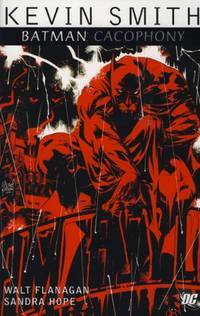 Compilation edition that contains material originally published as Batman: The Widening Gyre #1-6 sequel to the New York Times bestseller Cacophony..
DC Comics. Paperback. 1401228763 Please allow 4 - 14 business days for Standard shipping, within the US. Thank you for supporting our small, family-owned business! . New. 2011-10-04. First Edition. DC Comics. Paperback. 1401228763 Please allow 4 - 14 business days for Standard shipping, within the US. Thank you for supporting our small, family-owned business! . Fair. 2011-10-04. First Edition. DC Comics. Paperback. 1401228763 Please allow 4 - 14 business days for Standard shipping, within the US. Thank you for supporting our small, family-owned business! . Fine. 2011-10-04. First Edition. DC Comics. Hardcover. 1401228755 Good condition ex-library book with usual library markings and stickers. . Good. 2010-03-06. Good. Ships with Tracking Number! INTERNATIONAL WORLDWIDE Shipping available. May not contain Access Codes or Supplements. May be ex-library. Shipping & Handling by region. Buy with confidence, excellent customer service! DC Comics. Paperback. 1401224199 Please allow 4 - 14 business days for Standard shipping, within the US. Thank you for supporting our small, family-owned business! . New. 2010-09-07. Reprint. DC Comics. Paperback. 1401224199 Please allow 4 - 14 business days for Standard shipping, within the US. Thank you for supporting our small, family-owned business! . Fine. 2010-09-07. Reprint. DC Comics. Paperback. 1401224199 Please allow 4 - 14 business days for Standard shipping, within the US. Thank you for supporting our small, family-owned business! . Fair. 2010-09-07. Reprint. DC Comics. PAPERBACK. 1401228763 Item in good condition. Textbooks may not include supplemental items i.e. CDs, access codes etc... . Good. New York, NY, U.S.A.: DC Comics, 2009. Fifth Printing. Trade Paperback. NEW. Flanagan, Walt (illustrator); Hope, Sandra (illustrator). Brief summary of content available upon request by e-mail. DC Comics. PAPERBACK. 1401224199 *LIKE NEW* Ships Same Day or Next! . Fine. DC Comics. PAPERBACK. 1401224199 *BRAND NEW* Ships Same Day or Next! . New. DC Comics. Bright and crisp copy. Corners are sharp. No creasing. . Fine. Soft cover. 2010. DC Comics, 2011-10-04. Paperback. VeryGood. 10.0787 inches 6.5354 inches. DC Comics. PAPERBACK. 1401224199 Good condition ex-library book with usual library markings and stickers. . Good. DC Comics. PAPERBACK. 1401224199 Item in good condition. Textbooks may not include supplemental items i.e. CDs, access codes etc... . Good. DC Comics. Used - Like New. Like New condition. DC Comics, 2009. Hardcover. Good. Tall hardcover. Sound & nice copy, light to moderate edgewear. Jacket is bright & clean, light to moderate rubbing/edgewear. May not be available for international shipment at usual rates due to weight/size. NEW YORK: DC COMICS. U.S. format comic. Colour comic strip art. A large split on the cover spine edge, weakens the front cover. Interior is very fine. Comic Grade: Fair overall. Issue 2 of a three part mini-series. . Good. COMIC. First Printing. 2009. DC Comics. Hardcover. 1401228755 Crisp pages. Heavy shelf wear on cover. Light shelf wear on dust jacket. Light tanning. Good reading copy. . Good. DC Comics. Good. Ships Within 24 Hours M-F- Satisfaction Guaranteed! Has a publisher overstock mark. Item is in Good Condition. Clean Copy With Light Amount of Wear.